We know that our success is not just dependent on the quality of our product offering. We know you want, and deserve, quality service as well. At The Sweetman Group, we are here to serve you, offering a variety of services to help you make your vision a reality. On Site Consultations - Our sales team offers free consultation and planning sessions to assist you in making your project into a reality. We have worked with every budget and just about everywhere across Canada, so we are experienced and can help you create the playground you're envisioning. Design Services - We have in-house designers who will work with you to create an exciting, one-of-a-kind, play experience. You can rest assured our Certified Playground Safety Inspectors will consider all aspects as they help you design the playground best suited for your community. Installation - This is where it becomes really fun! Our licensed and insured professionals will work right alongside your volunteer team and make your installation period a great community experience. Community Builds - We provide a certified advisor for your volunteer group. 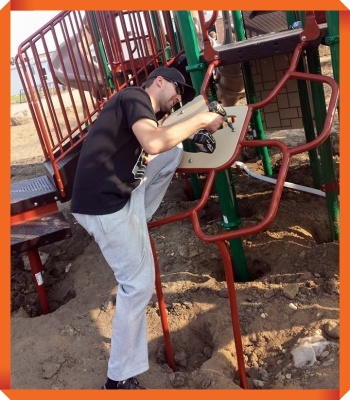 Maintenance Checks - The maintenance check-up is done by a certified playground inspector. It includes a visual inspection of all playground equipment, surfacing, site amenities and shade. We check for sharp edges, hardware connections, and so much more. We believe in safety first. Safety Inspections - If you have safety concerns, or need to verify compliance of your area, call us here at The Sweetman Group (1-403-556-7300). Building a playground is a job for your entire community! Play brings people together, so start by gathering local residents, organizations and professionals to help tackle the different facets of building a playground. There's plenty for people to do on when it comes to a Community Build, from assembling playground components to manning the food and registration booths. You'll find our Guide to Planning to be of great value when assigning volunteers different tasks. Fundraising events provide a fantastic opportunity to earn money while getting the entire community excited and engaged. Our information guide is a great starter for creating any successful fundraising effort. Here's some of our own ideas that should serve you well as you begin your building plans.